360 degree rotating, and flexible arms makes it easy to position the phone at the ideal distance and angle for convenient viewing. Adjustable clip height, the longest height is 70mm, it is compatible with most tables and desks of different thicknesses. This Holder total length is 33.46 inches(85cm). Compatible with cell phones from 3.5 to 6.3 inches. Perfect for watching movies & enjoying music in the bedroom, kitchen, gym and office. Adjustable clip makes you clip this holder to many areas like table, bed, sofa, the adjustable height is 0-70mm. Easy to install without any tools, fit for Lazy very much. We promise 24 months warranty and pursue 100% customer satisfication,just buy it without any worries. 360 DEGREES ROTATION -Making holder adjustable to view your device at any angle.Protect your cervical spine, relieve fatigue.Fit for people who have cervical spondylosis. FIT FOR ALL SMART PHONES PERFECTLY-It can hold 3.5-6.3 inches phones. STABLE-Designed with flexible long arms clamp(33.5 inches), Anti-twist and anti-stress design makes you use it more stable, will not easily droop. 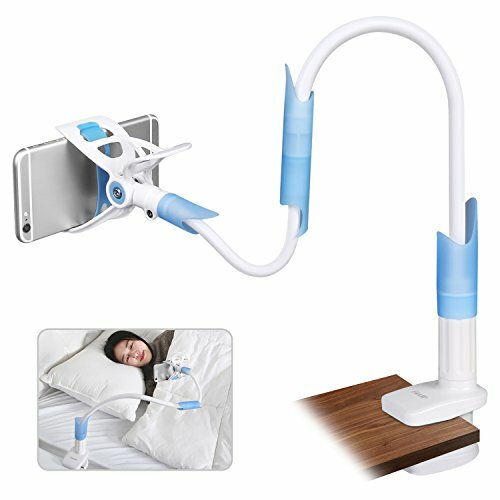 Multifunctinal-Really free your hands.You can use it watching movies, playing games, reading, enjoying music on bed, desk, sofa and any other places, portable and convenient. Long Life Time: Aluminum-magnesium alloy solid core makes it more durable, we promise 2 years gurantee, any problem please contact us freely. If you have any questions about this product by Gladle, contact us by completing and submitting the form below. If you are looking for a specif part number, please include it with your message.